The simple way to take profit from your crypto portfolio. Have a Shrimpy account where you manage your portfolio. If you don’t have one yet, sign up here. Don’t worry, it’s free. Blacklist the asset you want to use for taking profit. Let’s say you want to take profit into USD. You can blacklist a stable coin like USDT. Allocate the percent you want to take in profit as a percent in USDT. We will use 20% in this example. Therefore, 20% of our entire portfolio will be taken as profit into USDT. Rebalance your portfolio to allocate the designated percentages. This will trade into the asset which has been blacklisted and will be used for profit taking. Remove the profit taking asset from your portfolio. The asset should remain blacklisted, but must be removed from your portfolio. Otherwise, subsequent rebalances will result in continuous profit taking into the blacklisted asset. Repeat steps 2–5 every time you want to take profit. Let’s pretend the market has been on a rally and you want to take profit from your portfolio. 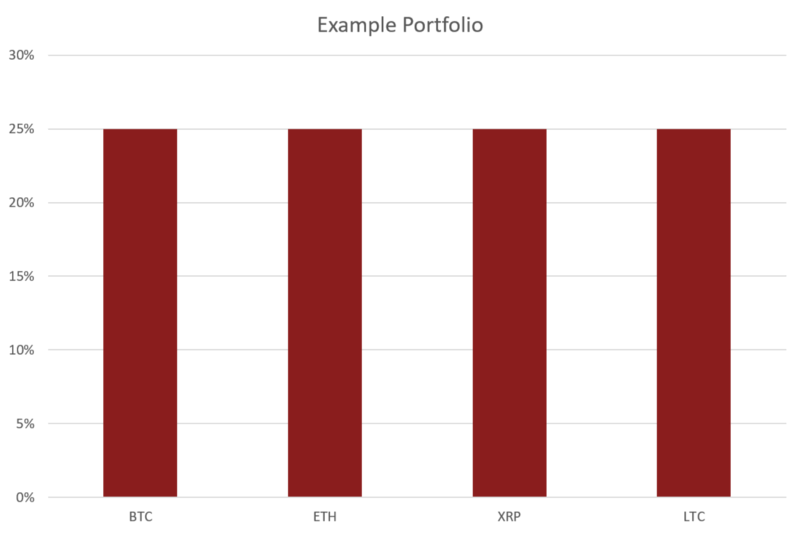 You have four different assets allocated in your portfolio as depicted below. Our example portfolio with 4 different assets. 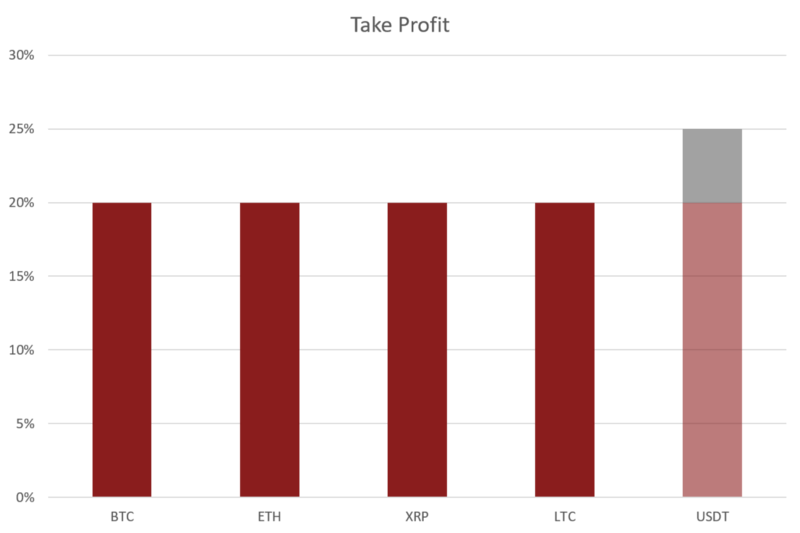 Since we would like to take 20% of our portfolio as profit, we will blacklist 25% of our portfolio value in USDT. This will be enough to cover the 20% of your portfolio that will trade into USDT. Enter a blacklist for 25% USDT. Once the blacklist has been entered, we will add an allocation in our portfolio for 20% USDT. Once added select to rebalance. After the rebalance is complete, you will have 20% of your portfolio taken as profit in USDT. The results will look like the following image. Profit has been taken in USDT. Before you rebalance again, remove USDT from your allocations to prevent Shrimpy from buying more. If you don’t remove the allocation, Shrimpy will buy more USDT since we blacklisted 25% of our portfolio in USDT but also allocated 20% for profit taking. Shrimpy treats that 25% as not part of your portfolio, so it will continue to buy until you own 25% + 20% USDT. Taking profit is a simple process for Shrimpy users. Instead of manually executing trades on the exchange to perfectly allocate your portfolio and take profit, Shrimpy can quickly adjust portfolio allocations to take profit and then swiftly go back to executing your strategy. No struggle, no problem. Enjoy life while you let Shrimpy manage your portfolio. Shrimpy is an automated crypto trading & portfolio management tool that lets users automate their strategy. Configure a custom portfolio and implement a passive strategy, removing the hassle of actively trading crypto. Shrimpy’s Universal Exchange API was created as a cloud-based solution to address several crypto developer roadblocks including Exchange Trading, Product Scalability, and User Management. Instead of managing connections to every exchange, developers can leverage Shrimpy’s trading infrastructure.